There’s just nothing that can beat their taste early on a summer's morning. Strawberries are hardy, perennial herbs grown throughout the United States, Canada, Alaska and parts of the Yukon. They thrive best in cool, moist areas, but, with special treatment, can even grow in the hot, Gulf states. Although cultivated in Europe since the 16th century, the strawberry didn’t become popular as a fruit in the “new world” until approximately the 1840’s. Strawberries prefer to grow in any soil which is not too alkaline, too dry, or in need of drainage. The best is a light, rich loam with plenty of humus and a pH factor between 5 and 6. If you are planning on planting Strawberries in the spring, prepare their bed the previous fall on a plot which has been cultivated for at least two years. A site which slopes slightly is best because of the perfect drainage it will naturally provide. And a southern exposure greatly assists with the earlier formation of blossoms and fruit. Be careful, though, if late frosts are prevalent in your area, as the southern exposure may fool you and cause you to remove the mulch too early. Sterilized manure may be turned under in the fall at a rate of 500 lbs for each 1,000 sq. ft. of proposed strawberry patch. At the same time, compost or leaf mold may be stirred into the top layer of the soil for further enrichment. If no manure is available, leaves and lawn clipping may be worked into the soil at the rate of five or six bushels to each 100 sq. ft., accompanied by liberal amounts of cottonseed or dried blood meal, ground phosphate rock, and bone meal. Limestone should be avoided unless the soil is very acidic – below pH5. You can expect to harvest about 1 quart of berries from each plant you set out, so 25 - 50 plants will provide plenty of fresh berries for a family of four. For freezing berries, set out an additional 50 to 100 plants. Be sure to buy new plants rather than getting strawberry runners from neighbors or relatives. New plants are certified to be free of diseases and viruses while there are never any guarantees with plants received from others. When purchasing your plants from a nursery or garden center, it would be wise to take the following into consideration: disease resistance, yield, how long until ripening (especially important in Northern climates), and dessert and freezer quality. 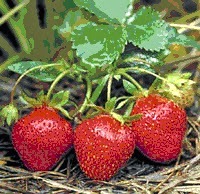 Plant your strawberries as early in the spring as the soil can be worked – normally early March to early April. Test for workability by digging a shovel full of soil and tightly squeezing a handful. Does the ball of soil break easily? If so, it is ready to till. Young plants showing vigorous roots should be used for your strawberry bed. Before planting, first cut out any damaged or diseased leaves or roots. Dig a hole for each plant large enough to hold the roots without crowding. A mound of soil is heaped in the center of the hole, and the plant seated on the mound with roots pressed firmly into the soil all round the base of the mound. Each plant should be set so that the soil level will naturally cover all the roots, but will not cover any of the small leaves which are beginning to develop in the crown. Fill the hole halfway with soil. Pour in water to wash the soil around the roots. Then fill the rest of the hole and firm the earth around the plant. An inverted berry box or basket placed over the newly planted strawberries will prevent drying during the first few days. Note: from the time you first take the strawberry out of its container to the end of the planting process when it is firmly in the ground, the roots should never be exposed to sun or drying winds. If the day is sunny, the plants should be shaded at all times. A damp layer of sphagnum moss or a piece of wet burlap may be placed over the receptacle containing the plants in order to prevent drying. There are several ways in which strawberry beds can be grown: rows, matted rows, and hills. This is the way in which many commercial growers plant entire fields each spring for the following year’s production. Plants are set 18 – 42 inches apart, depending upon how many runners the particular variety of strawberry can be expected to make. Most of the runners are permitted to grow during the first season, with only the fruit buds being removed to strengthen the plants. A mat of strawberry plants forms as the growing season progresses. After their time of bearing is complete, the entire field is plowed under and process begun again the following spring. This system is most often used for strawberry varieties which are slow to send out runners and produce daughter plants, or for any variety when especially fancy fruit is desired. Because of the extra work involved, the system is not widely practiced, but is ideal for the home garden. Strawberry plants are set out in rows approx. 12 inches apart and a select number of daughter plants are allowed to form. The selected runners are spaced appropriately from the mother plant, and the runners are then covered with soil to hold them in place until the new plant is firmly rooted. Late-formed and surplus runners are removed. When using the hill system, plants are close together and runners are pruned off. Plantings are usually made in double or triple rows. Plants spaced 12 – 18 inches apart, with a 20 – 24 inch alley between rows. No daughter plants are allowed to develop, and fruit production is entirely dependent upon the yield of the mother plants. Individual plants, however, can become quite large and bear more than those in the matted-row system. The matted-row and hill systems are both temporary, with the plants being plowed under after 2 – 3 years production is finished. The spaced-row method, however, can be used indefinitely as new plants are always being formed. A self-perpetuating strawberry bed under permanent mulch may be freshly planted, or it may be started with an already established bed. Soil should be prepared as mentioned earlier. Plants are set 12 inches apart in rows that are 2 ½ feet apart. As soon as the strawberries are set into place, the soil in the rows and in the paths are covered with a 6 inch layer of mulch, such as grass clippings, straw, ground corncobs, pine needles, or chopped leaves. Plants are well-watered, and are left to develop runners through their growing season. If new plants have been set, all fruit buds should be removed, to permit all the strength to go into runner development. Though runners seem to sit on top of the mulch, they will send rots down through it to the soil below. As the mulch decomposes, the layer will shrink from 6 to about two inches, and the newly rooted plants will be only slightly above the soil level. If an old strawberry bed is being used for a permanently mulched bed, preparation of the bed begins with the harvesting of this year’s strawberries. As the picker harvests, he marks with pegs or plant markers the beast-bearing plants in each row, trying to space markers about 10-12 inches apart. When all berries have been harvested, all the unmarked plants are pulled out and mulch is removed. Well-rotted manure, compost, decomposed sawdust, plus cottonseed meal or enriched leaf mold are then worked into the top layer of soil. If the soil is too alkaline, a generous amount of peat moss is incorporated around each plant. The soil is smoothed out, and a six inch mulch is again placed around plants which are ready to form runners. By careful selection of the best bearers, a strawberry patch can be made to bear a larger crop with each succeeding year. The heavy mulch during the summer will preserve soil moisture for the young plants, and the decomposed mulch on top of the bed will enrich the soil, which gradually becomes blacker and more mellow. Strawberries can be grown in barrels, in special strawberry pots, on movable strawberry walls, and in hanging baskets if you should need to move them around to keep them in the sun. Strawberries need good drainage and a soil with plenty of humus. You can grow them from healthy plants bought from nurseries or garden centers, or the plantlets that form on the varieties with long runners can be pegged down to form new plants that are planted out in the summer. Strawberries must be protected from frost when they are flowering and fruiting. They should also not be kept for more than 3 years as virus diseases are likely to occur. It's best to burn the old plants, and then plant out new. You can make a strawberry barrel by taking one end out of an old barrel, drilling drainage holes in the other end, and making 2" holes in two or three rows around the sides. The first row should not be less than two feet from the base of the barrel, and the positions of the holes should alternate so that the holes in adjacent rows are not directly above or below each other. Place a two inch perforated zinc tube in the center of the barrel as low as the first row for watering, and fill around it with good potting soil. Place a strawberry in each hole and some more in the top of the barrel. Place the barrel in a sunny location and keep it well watered once growth starts, being sure to add manure or fertilizer in mid-spring. The strawberries will grow and run all over the barrel. A Strawberry Pot is just like a small version of a strawberry barrel, but made out of clay. It is used in exactly the same way, but needs more frequent watering due to its smaller size. A Strawberry Wall is made of a framework of wire mesh. Strawberries are planted at the bottom and trained to climb up and over the wall. Like the strawberry barrel, it can be moved to keep it sheltered from frost early in the year and to take it out of the sun later on. Another good way of growing strawberries is to use hanging baskets. Leaf spot is caused by the fungus Mycosphaerella fragariae. The leaf spot fungus can infect leaves, fruit, petioles, runners, fruit stalks, and berry caps or calyxes. The most obvious symptoms of the disease are small, round spots. These spots develop on the upper surface of the leaf and at first are dark purple to reddish-purple. They range in size from 1/8 to 1/4 inch in diameter. With time, the centers of the spots become tan or gray and eventually almost white; while their margins remain dark purple. Later in the season, tan or bluish areas form on the underleaf surface. Temperatures between 65 and 75 F are ideal for infection and disease development and infections may occur throughout the growing season, except during hot, dry weather. Young, expanding leaves are the most susceptible to infection. Symptoms of leaf spot on other plant parts, except fruit, are almost identical to those on the upper leaf surface. On fruits, superficial black spots may form during moist weather. The spots form on ripe berries and around groups of seeds. This disease is caused by the same fungus that causes strawberry leaf spot. Red stele, the most serious fungus disease of strawberry plants in the US. Causes plants to wilt and sometimes die just before fruit starts to ripen. Like other fungi, it is most active in wet weather, and may sometimes disappear in warm, sunny conditions. The disease is most destructive in heavy clay soils that are saturated with water during cool weather. Once it becomes established in the field, the red stele fungus can survive in soil up to 13 years. Fruit from affected plants is small, sour and few in number. Control is best achieved by removing any plants with coarse roots with no branching rootlets, by correcting faulty drainage that may exist in the berry bed, and, most important, by planting resistant varieties. Another fungus disease which is active in cool, humid weather is verticillium wilt. It causes the outside edges of the leaves to dry up and turn dark brown so that the plants appear dry and flattened. If you suspect verticillium wilt in your area, do not plant strawberries in soil in which tomatoes, peppers, potatoes, or other strawberries have grown in the last 2 years. Selecting resistant varieties is a must. 1. Select varieties that grow vigorously and are resistant to the diseases in your area. 2. Buy disease-free stock from reputable nurseries. 3. Rotate your berry patch regularly or, in the case of a permanent bed, replace old plants with runner plants each year. One of the most serious and common fruit rot diseases of strawberry is gray mold. During wet springs no other disease causes a greater threat to flowers and fruit. The disease is most severe during prolonged rainy and cloudy periods during bloom and harvest. Fruit infections usually appear as soft, light brown, rapidly enlarging areas on the fruit. If it remains on the plant, the berry usually dries up, "mummifies", and becomes covered with a gray, dusty powder. Strawberry infection is most severe in well-protected, shaded areas of the plant where the humidity is higher and air movement is reduced. Berries resting on soil or touching another decayed berry or a dead leaf in dense foliage are most commonly affected. Often, the disease is not detected until berry picking time when due to harvesting, the handling of infected fruit will spread the fungus to healthy ones. Leather Rot can infect berries at any stage of development. When the disease is serious, infection of green fruit is common. On green berries, diseased areas may be dark brown or natural green outlined by a brown margin. As the rot spreads, the entire berry becomes brown, maintains a rough texture, and is leathery in appearance. On fully mature berries, symptoms may range from little color change to discoloration that is brown to dark purple. Generally, infected fruit is dull in color and is not shiny or glossy. Infected ripe fruit are usually softer to the touch than healthy fruit. In later stages of decay, mature fruits also become tough and leathery. Berries that are affected by leather rot have a distinctive and very unpleasant odor and taste. Even healthy tissue on a slightly rotted berry is bitter. This presents a special problem to growers in pick-your-own operations. An infected mature berry with little color change may appear normal and be picked and processed with healthy berries. The resulting jams, however, tend to be bitter tasting. Leather rot is most commonly observed in poorly-drained areas where there is or has been free-standing water or on berries in direct contact with the soil. Here are some resources from various suppliers on the internet. Be sure you are online in order to use the links. The Berry Terrace is only 6 feet in diameter, but its ingenious 3-tier design gives you enough growing space for over a bushel of delicious, juicy berries. It assembles easily without tools and includes a sprinkler system—what a great value! Makes it easy to grow your own strawberries! Includes sprinkler system! Sturdy aluminum frames are self-locking. Barrel gardens overflowing with colorful flowers look great flanking a driveway, but wooden barrels crack or rot in a year or two. This Whiskey Barrel looks absolutely authentic, but it's actually made of indestructible 1/2"-thick recycled plastic that has the grain and texture of wood, bound by rusted steel hoops that give it an antique look. Best of all, this barrel is self-watering! Never cracks, rots or splits. Spare your back, and save your floors from damage, with this solid cedar caddy that makes it easy to move big, heavy plants—up to 200 lbs. The easy-glide urethane wheels roll smoothly over decks, patios, even carpets. Comes fully assembled. Grandmother herself never made cheesecake like this. We use only the sweetest, most flavorful strawberries and swirl them into the New York batter. Your cake is fresh-cooled and rushed from the bakery to your doorstep in a special cool-pack container to ensure freshness. You just can't resist, so go ahead and enjoy the delectable scent of cheesecake. Any way you cut it, it smells simply delicious. These Eli's Cheesecake Scented Tin Candles are 4 oz and have a burn time of 15 hours. Sold individually. Gardening Tips & Information - from basics such as composting and healthy soil to specialties like bonsai and kids gardening, here's an interesting list. Syllabub is a thick, frothy English dessert that was popular during the Victorian era. This recipe is adapted from recipe #1486 in Beeton’s Book of Household Management, originally published in the mid 1800’s. It deliciously combines the first strawberries of the season with another Victorian favourite, crisp meringues. 1. In a bowl, beat egg whites until foamy; beat in cream of tartar until soft peaks form. Beat in sugar 2 tbsp (25 ml) at a time until stiff, glossy peaks form. 1. In a bowl, whip cream with granulated sugar. Fold in sherry, lemon rind and lemon juice. (Make ahead; cover and refrigerate for up to 6 hours). 2. Spoon syllabub into meringue nests. 3. Top with sliced strawberries and garnish with mint leaves. 1. Beat eggs, sugar and vanilla until lemon colored. 2. Sift flour, baking powder and salt. Add to egg mixture, mixing by hand until combined. 3. Heat to boiling the milk and butter. Add all at once to first mixture, beating only until smooth. Either cut cake so that you have 2 or 3 thin layers, or cut into small sections as is. Top with strawberries, strawberry juice, & whipping cream, then drizzle with chocolate syrup. Please feel free to share it with your friends.